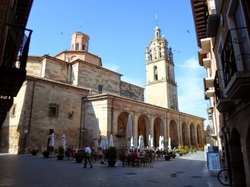 Today we wanted to do two walking stages which meant our goal was Logroño but after difficulties we ended up in Estella. We rode out and within a couple of hours we slowly climbed the peak of the Mount of Forgiveness, which is where there is a panoramic spot with cast-iron “cut-out” sculptures of pilgrims at the very peak of the climb as well as where the giant electricity producing windmills are located. Alto del Perdon is a sculpture dedicated to the pilgrims who walk the path of the Camino Del Santiago. The great metal sculpture representing pilgrims on foot and on horse reveal the eternal nature of the walk. There is an inscription on it in Spanish “donde se cruza el camino del viento con el de las estrellas” which translates to “where the path of the wind crosses that of the stars”. We had a mid morning snack there at the very peak, we sat out our lunch on the windy side of the mountain but the wind was blowing too hard, so we moved to the other side of the peak and now with about 20 other pilgrims enjoyed the view and a bite to eat. We soon had our first flat tire of the trip, we were in the middle of a vineyard when Jessica’s tire went flat, I had not changed a flat tire since I was probably 12-13 years old. I looked down at the tire and thought..I have not done this before, what am I going to do? When I raised my head there was the light from the sun at my face and a man right beside me, who asked me how he could help. At the time it felt like it was an angel coming to help me, because it was so sudden, I did not have to go out to find him, he was just there when I needed him most. Anyhow this angel of mine was Jose, he was trying to get so many Kilometers in today, I’d say he was about 10 years older than I, but in great shape who had probably been cycling all his life. He took the back tire off the bici and took out the inner tube but my air pump was not working well so he pulled out his air pump. We now needed water to check the inner tube for a leak. At this time a farmer comes by in his tractor and we asked him where we could find water, he pointed back about 50 yards where water collected for the irrigation of the grapevines. Jose helped me throughout the whole process of fixing a flat tire. I was fearful of hitting the jagged rocks on the trail, thinking we would get a flat and the cause of our first flat was a rose bush thorn about a quarter of an inch long. Jessica did tell me later that she did see Jose walk up while I had my head down looking at the puncture. We went on with our ride but we knew we needed to make up some time, we see a highway in the distance and Jessica says she wants to go on it so we do not get another flat tire. I agreed, we cut through a farm and head down to the faster cleaner road. We were now cruising for about 20 to 30 minutes, cars are honking at us, we thought that was nice, their way of saying “Buen Camino” when we come across an overpass and see the police down below stopping traffic. They blew their whistle at us to get our attention, but we rode on, then as we got to the other end of the overpass they rode their patrol car up the ramp and stopped us. We were told we were not supposed to be on the Autopista, they tell us to get down and we were escorted down to a safe spot, I apologized hoping they would let us go without making too much out of it. But one policeman told us to go over to the main car and wait there, I knew we were in trouble. We got there and it looked like the boss was pretty upset, he asked where we were coming from , I told him just up the road. He asked me how we got there , I told him through a road in a farm. By this time I kept my mouth shut and agreed with our mistake that we did not see any signs indicating we could not be on the main highway. He got a little sarcastic, saying, you all must have been able to make great time riding on the Autopista. I said to him, I understand what you are saying, it was our mistake and that it was my 16 year old daughter making the pilgrimage, and we did not have any maps – He was still upset and told me that he was only going to let us go because I was with my daughter otherwise he would have taken us in to pay a fine. I felt that playing the Jessica card would hopefully let us out of this situation. We apologized again; he told us what road to go on our way to Logroño. We went into the town got ourselves a drink and got on the NA-1110 which is the equivalent of our FM roads (Farm to Market). We moved on to Estella, it was now about four in the afternoon and we were tired. Estella is a large town and we needed to get some money. We were headed to an albergue when we see a group of about 10 coming out saying that it was booked up, that they needed to find another albergue, I recall seeing signs for another albergue a few streets back and I quickly told Jessica, lets go before that one fills up as well. I knew our chances would be slim if we got there after the big group. We turned our bikes around and headed towards Albergue de ANFAS de Estella. It turned out to be just about full; they tended to us just as the big group arrived. They were also turned away there as all that was left was just a few beds and they wanted to stay together. 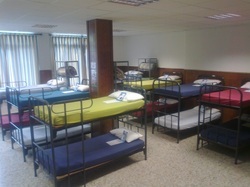 Albergue de ANFAS is run by mentally disabled citizens from the town, they were very helpful. After we put our bikes away and got our beds we got cleaned up and I went to town to get some money, and soon found an ATM. I thought I’d give it shot. It worked but I did not get my debit card back and the bank was closed, I ended up texting Carmen to cancel the card. In the evening Jessica and I walked the town a little and got dinner. After getting back to the albergue for the first time I had access to a computer in the common room and got some e-mails done.